Two weeks ago, there was a fatal explosion on the offshore oil rig Deepwater Horizon in the Gulf of Mexico. The rig sank shortly afterwards, and since then the well has been leaking crude oil into the Gulf, spreading an oil slick towards the U.S. Gulf Coast. This spill is pouring as many as 5,000 barrels (210,000 gallons) of oil a day into the Gulf and poses a serious threat to coastal industries, sensitive habitats and wildlife, including numerous species along the coastal areas of Louisiana, Mississippi, Alabama and Florida. Many government agencies and other organizations have made data publicly available, which we’ve compiled on our crisis response site dedicated to the spill. 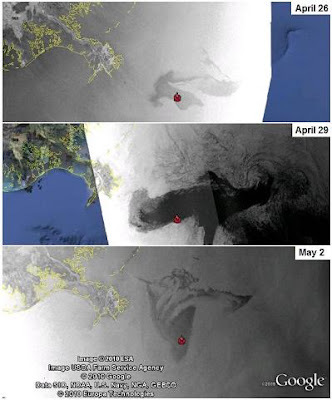 Last week we made imagery from NASA’s MODIS available as an overlay for Google Earth, which currently shows the extent of the oil spill through April 29, and we’ll continue to add more imagery as it becomes available. We’ve also made radar images from ESA’s ENVISAT available through this KML file. Below, you can see the progression of the spill over time. To view this imagery and other datasets in Google Earth, turn on the “Places of Interest” layer in the Layers panel on the left-hand side of Google Earth, then navigate to the Gulf of Mexico and click on the red icon. In addition to this imagery, our site contains maps of the locations of the oil, fishing closures and affected areas, the ability to upload videos directly to YouTube, and a link to a site where people in the area can contribute their observations. We hope these resources are useful to those affected by the spill, those responding to it and those learning about its devastating effects on the people and environment of the Gulf Coast.